One evening when my son returned from work he handed me a parcel saying his friend from Canada brought it for him, but actually it was for me. 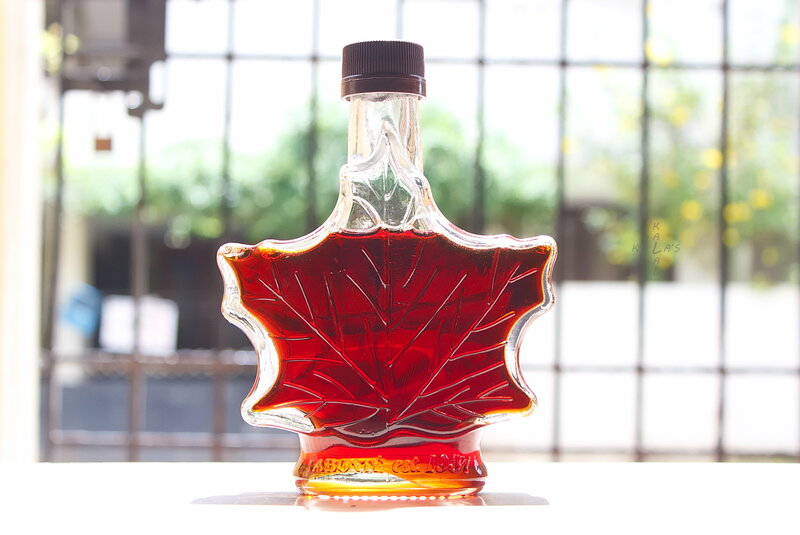 When I opened it I found a beautiful glass bottle of maple syrup, with a maple leaf engraved on it. Manoj had brought this for me seeing my cookery posts, and had this lovely thought of bringing this present. 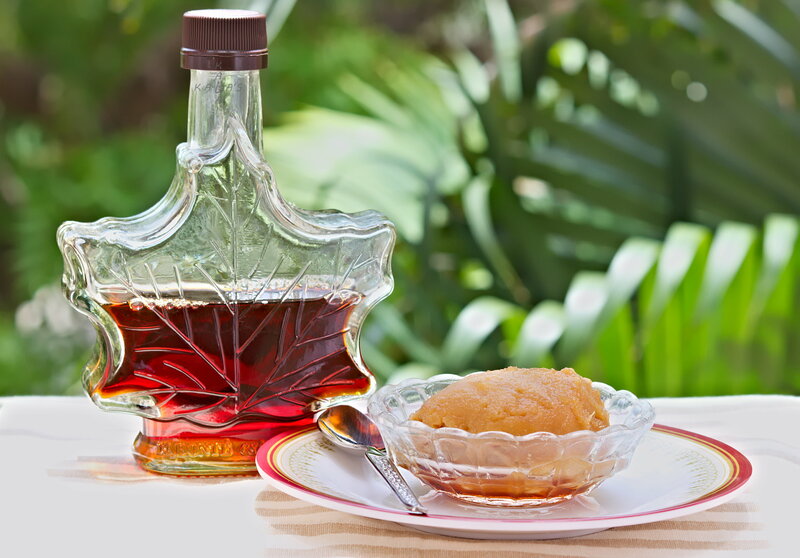 I was totally new to maple syrup, and was surprised by its mild sweetness and woody flavour. I was not familiar with recipes using maple syrup and again Manoj sent an outline of a recipe that he uses. I found that the maple syrup is not strong enough to overpower the distinct flavour of the Indian sweet potato. I have standardised the recipe but I have not used dates or dried fruits as suggested by Manoj as my son does not like them. Cooking with mushrooms was almost unheard of in the urban and semi-urban areas of Tamil Nadu. Therefore, there are not many mushroom recipes available. But in the last 30 years or so cultivated mushrooms have come into the market and now button mushrooms are available in all the supermarkets and high-end vegetable markets. Now that it has taken the fancy of housewives, even Tamil recipe books have at least one mushroom recipe. 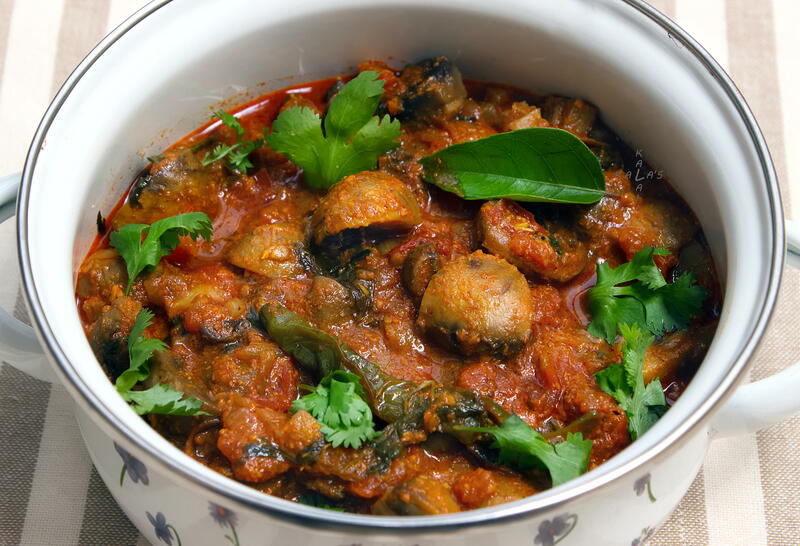 I have always been fascinated by the Coorg area, and when I came across Cuisine from Coorg by Ranee Vijaya Kuttaiah, I immediately looked for mushroom recipe in her collection, and there it was, the Koomu Curry. I have taken the liberty of making it less spicy (less hot) and also changed the method of frying the masala to make it more flavourful to compensate for the earthy taste of the mushrooms. I have also made it easier by using powders rather than grinding whole spices. 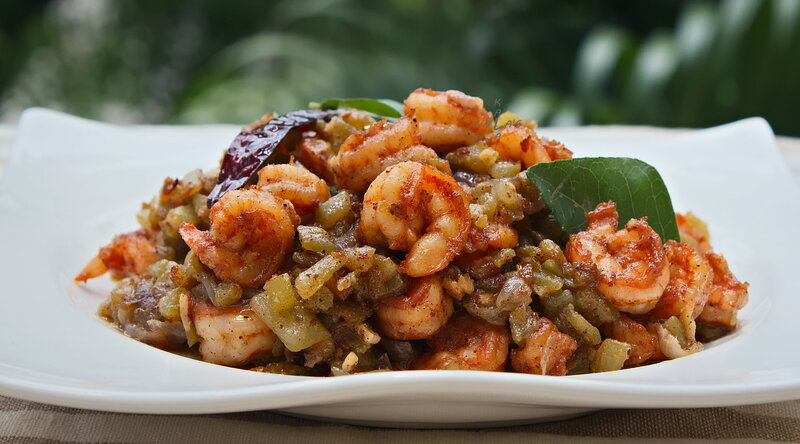 Tamilians include commonly available vegetables in non-vegetarian preparations to extend the dish and to add vitamins, minerals, and fibre to the diet. Prawns lend themselves to a variety of such combinations. Snake gourd (pudalankai) is a native vegetable easily grown in kitchen gardens and is mostly used in fries (poriyal) and dhal curry (kootu). With the highly priced prawn, the dish is elevated to a higher status, providing a most delicate and delicious combination of flavours. In Thirunelveli (where I hail from) Adai is made traditionally by soaking rice, red gram dhal, and green gram dhal, and grinding these in a wet grinder. Red chillies are soaked in water the previous night and are ground along with the batter. I have always found it tedious to prepare adai for breakfast in this manner. One day I was wondering what to do with a cup of leftover dosai batter. 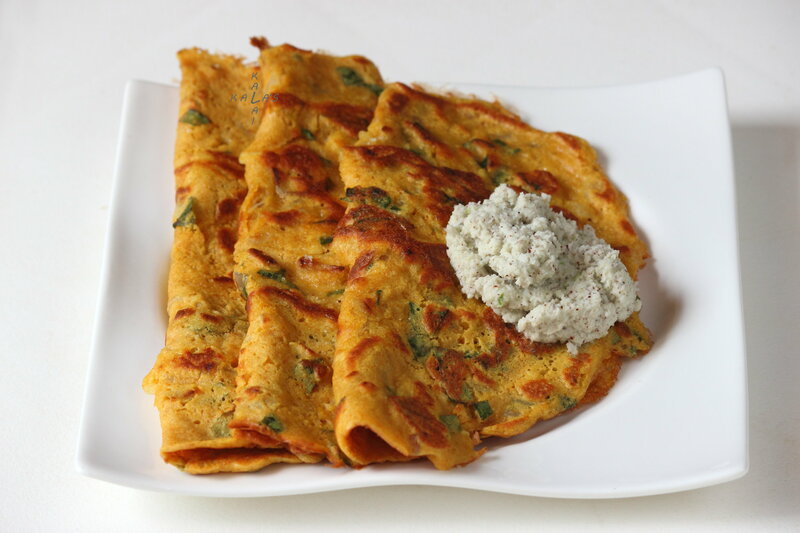 A bulb flashed in my head and I thought why don’t I try to make adai using this batter with bengal gram dhal flour (kadalai maavu/basan) which is readily available in India and skip the time and labour involved in grinding. Apart from the batter, I have strictly followed the ingredients my mother used to use in the preparation of adai, including the oil.